I used to share these dreams with people who were genuinely interested, even though a funny little diddy on This American Life a few months back taught me that dreams are one of the seven things you’re not supposed to talk about (because they’re boring to others). But these story sessions—I remember many taking place around elementary, middle school, high school, and even college tables—were never self-indulgent, though I did enjoy getting a few laughs at my own expense. And I liked feeling naked. Though articulate enough in formal situations, I’m not always the best casual speaker, but my dreams came alive when spoken rather than written, and I told them, surprisingly, with clarity. I also enjoy recounting my dreams to, well, myself, as soon as I sit down at the breakfast table after waking. Sometimes I merely reflect but other times I write or type out the scenarios as fast as my fingers can go so that I won’t forget a detail. I get frustrated when something does slip, but that’s common. I make tea, get together breakfast, and think about dreamland, remembering a haze of purple and a trance-like score before the actions and the people and the setting come rushing. The ritual feels spiritual to me, someone who doesn’t really hold onto religion. The only spiritual truth I can believe is the one coming from inside me. My nights have been unproductive for some time now—at least 6 months. I haven’t dreamt. Or at least I haven’t been able to remember any animated projections in that time if they’ve played in the background. It’s not stress or anxiety—my dreams (and sometimes nightmares) are the loudest at times of unrest. I remember a time when I’d feel myself slipping out of REM and my unconscious would fight my conscious to stay sleeping, stay dreaming for enough time to see a plot through. My skin would feel sweaty after the battle; my sheets would be tangled, and a pile of blankets and comforters (yes, plural) would find itself at the foot of the bed. I miss the fight—the fight to stay in fantasy land. The only dream-like experience I’ve held onto is that one when you first slip into deep sleep and feel like you’re falling so your legs go a mile-a-minute before you wake fully and need to start over again. My lack of dreaming seems to be connected to a greater absence of creativity lately. My written words have seemed plodding, and my imagination has been less active. I’ll blame it on this brutal winter that’s tested me and made me question my life choices and future. I’ll blame it on winter so I don’t feel like something’s truly missing. And I’ll eat my breakfasts while reading or listening to others’ stories. 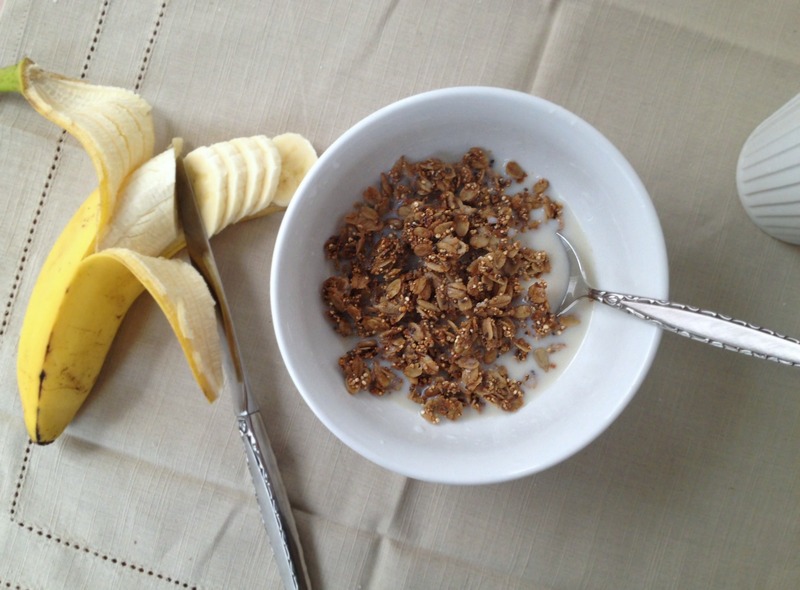 “There are two types of granola eaters. The first type of people want to be able to run their hands through granola like it’s silky-smooth hair. These people want the oats to fall through their fingers like millions of grains of sand, leaving no chunks or lumps behind. But irregular clumpage isn’t my only requirement. Ohhhh, there’s a long list: I want my granola to be intensely toasty (I hate the raw taste of barely browned oats). I want my granola crunchy (granola with oats that retain chew is too cookie-like for me). But I don’t want it just crunchy; in fact, a better word would be crisp. Intensely crisp. So crisp you feel it in your ears. Hold on, though; I also want it light. Light and crispy. In other words, I don’t want the granola to be hard. I want it to shatter like tempura coating. I want it to be Lay’s Original chips not kettle chips. And I want it to be healthful and taste healthful too (I don’t want it to feel like dessert, and I don’t want it to be like a wannabe wholesome treat that tastes sinful but is really good for you). No, I want to taste those oats, those seeds, and those nuts. I feel the earth in their savor. I do not want to taste the sugar. The warm flavors of the aforementioned ingredients are too delicious to be covered by excess sweetener. I don’t mind the addition of dried fruit or chocolate or other nuts, but I prefer those for granola that I eat out of hand for a snack or for dessert. I want my breakfast granola—my thick, fatty, Greek yogurt–topping granola—to contain only the nuts and bolts, with limited flavorings. And I definitely want it to come out of my own kitchen. But unfortunately, I hadn’t met my dream granola until I was tipped off to purely elizabeth brand. 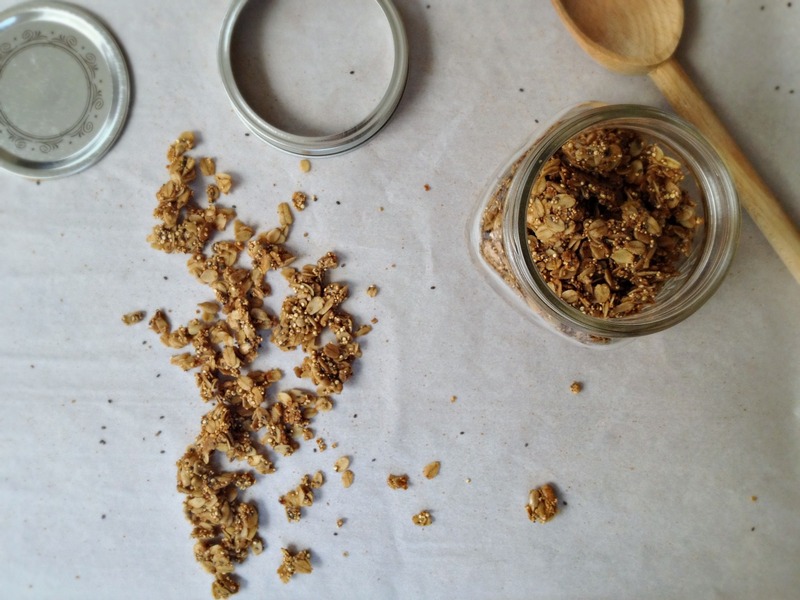 And for once, I’ll admit to putting more stock into something that came off of a store shelf than out of my oven.Well, until I made this granola below, and it is now my go-to formula. With a little help from the ingredient label on the purely elizabeth product I came up with a granola that I love even more than elizabeth’s. I love the subtle molasses notes of coconut sugar which is a good sugar to turn to to avoid cloyingness. I love the wholesome taste of coconut oil for the fat here. (For those of you who do not work with coconut sugar or oil, neither will make this granola taste like suntan lotion, or even like coconut. They both add simply a nuttiness that is wonderful.) I love the add-ins: A generous amount of puffed amaranth, crunchy quinoa, energizing chia seeds, and earthy sunflower seeds. And grinding a small portion of the oats into a flour helps the granola stick together. I love the liberal amount of salt that makes the flavors come alive. I love the crisp texture and the ability to make clusters of my desired size. And I love how, well, pure it tastes. Want to add cocoa nibs? Delicious. Want to stir in dried fruit? By all means. Want to change the spices, add herbs, substitute buttery chopped pecans for sunflower seeds? You go, girl/boy. I do many of these things. But if you want to eat the granola in my favorite way, as written, you’ll learn a little bit about my story in your breakfast. You might not like it. It might be too seedy, too savory, or too earthy. But that’s why it’s my granola. And I hope to be able to accompany it with my dreams once again. The method below, for me, is the best for popping amaranth, which can burn in an instant. The amaranth will quadruple in volume. 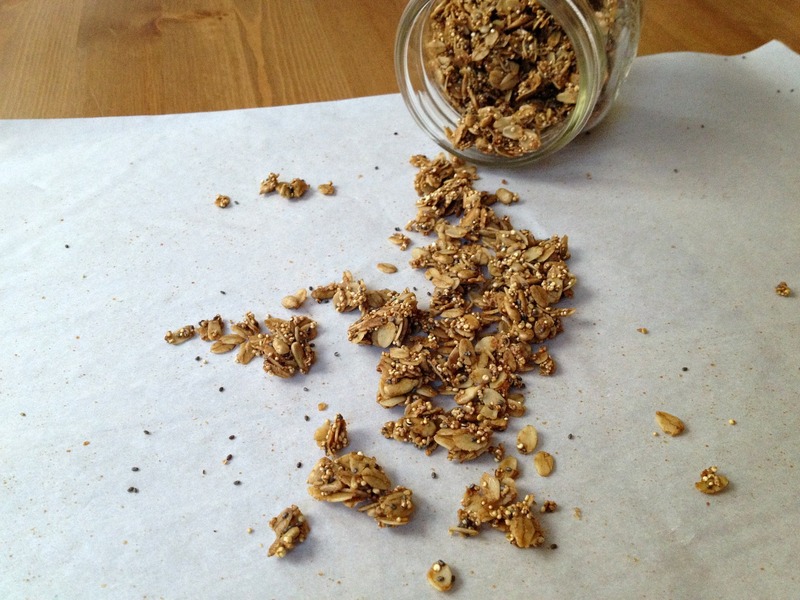 This granola comes out as one big sheet, so you can break it into the desired-size pieces. I like a combo of clusters and singular grains. 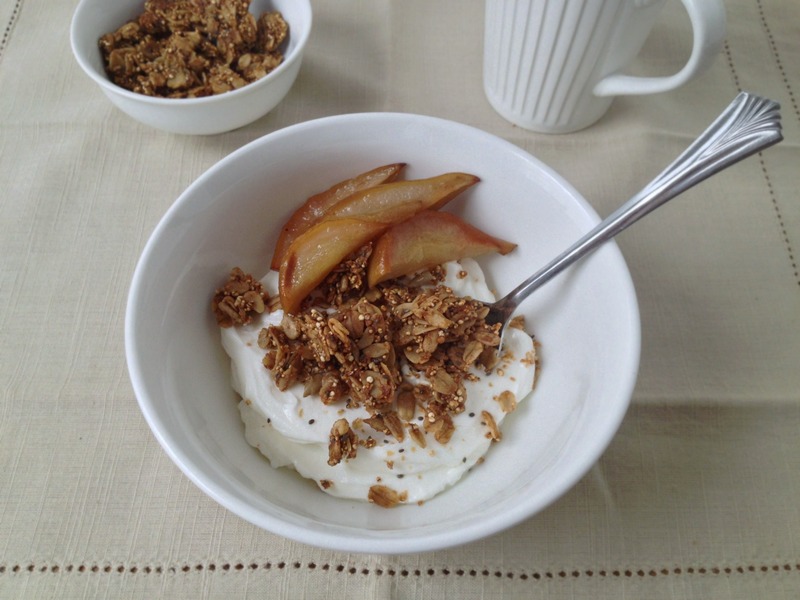 Add other mix-ins if you like, but stir in dried fruit or toasted coconut after you’ve broken up the granola. 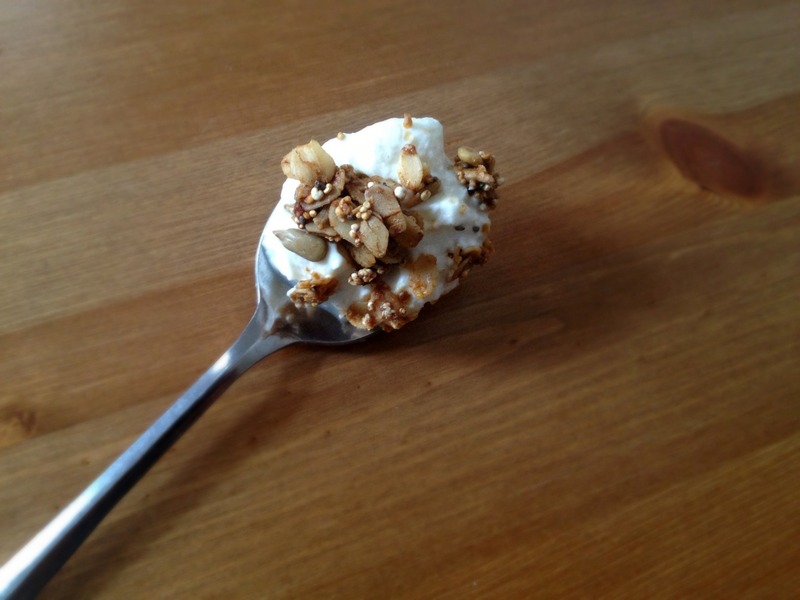 Nuts that go in the granola before baking should not be toasted. Check the granola often as it can go from golden and nutty to burnt quite quickly in the last minutes. I like to push it as far as I can for the best flavor and texture. 70 grams (½ cup) sunflower seeds. 1. Adjust oven rack to middle position and heat oven to 300 degrees. Line rimmed (18 by 13-inch) baking sheet with parchment paper. 2. Place small saucepan over medium-high heat, add a few amaranth grains, and heat until amaranth grains are dark brown in color. Discard dark brown amaranth, add 1 tablespoon amaranth, cover, and cook, shaking pan constantly, until amaranth begins popping, about 5 seconds. Immediately lower heat to medium and cook, shaking pan constantly, until popping begins to slow down slightly and about ¾ of the amaranth grains have popped, about 20 seconds. Immediately transfer to large bowl. 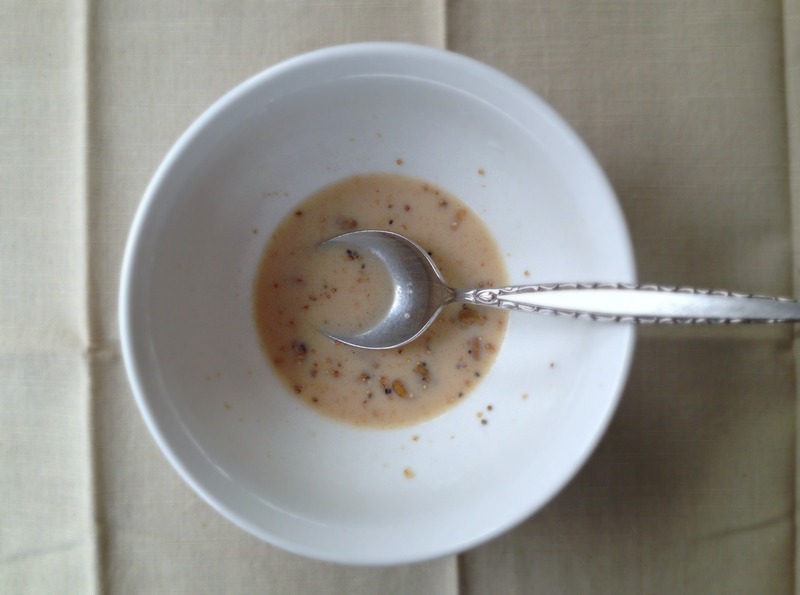 Repeat 2 times with remaining 2 tablespoons amaranth. (You should have 3/4 cup puffed amaranth.) Let amaranth cool completely. 3. Process 25 grams (¼ cup) oats in food processor until mostly finely ground. Add remaining whole oats, sunflower seeds, quinoa, chia seeds, 1½ tablespoons coconut sugar, cinnamon, salt, and ground oats to bowl with cooled amaranth; toss to thoroughly combine. 4. Place remaining coconut sugar in now-empty saucepan. Add water and stir well to combine and dissolve some of sugar. Heat coconut sugar-water mixture over medium heat, stirring constantly until it just begins to boil. Off heat, add coconut oil and stir to melt. Add sugar-oil mixture to oat mixture and stir with rubber spatula to thoroughly moisten and combine. Transfer sheet to wire rack and let granola cool completely, about 1 hour. 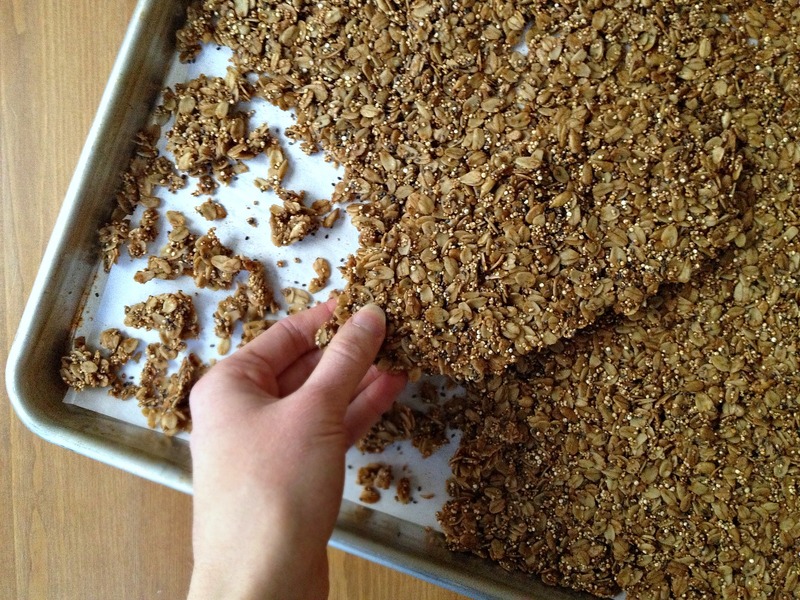 Break granola into desired-size pieces. Granola can be stored for about 2 weeks in airtight container. Yes to everything you’ve said here. I want grains and clusters, a bowlful of something not laden with butter and sugar in the morning. This granola looks divine. I like both the clusters and the grains. I like to eat the small crumb bits on yoghurt or porridge and sneakily eat the clusters straight from the jar (I have many bad habits; this the most forgivable). Thanks for sharing the recipe. It looks great! I’m glad to know I’m not alone in wanting it all! You ARE a writer – you don’t give yourself enough credit! 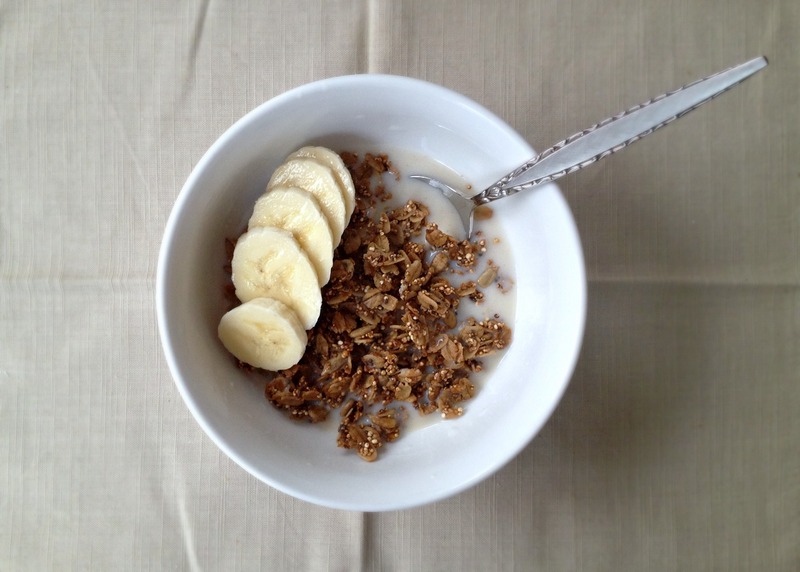 I think you write beautifully :) I also like the big clusters and grains in granola, and really like the subtle flavor and aroma that coconut oil lends. Aw, that’s so nice of you! I think I more so meant that I’m an editor by profession and write less, but I guess “writer” can mean many different things. I’ve definitely always thought of you as one. A beautiful post! I don’t like granola that cuts up my mouth! Thank you! It’s so interesting to learn what people like in such popular breakfast/snack—there are so many ways to make it. i totally dig for the clusters :) this looks great!